For some time now, we have been using hex maps, over traditional square grid boards, to depict the Playing Field and Movement (see page 3-1). 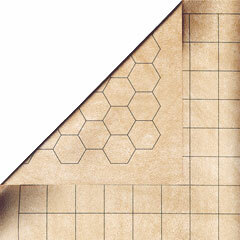 We suggest, instead of building a playing board, buying a Chessex's Battle Map and use the hex side of the map to play Saga of Logatroth. Recently, at Marmalade Dog 17, I bought a 4' x 3' Battle map for $35.